When talking about types of stomach cancer, we surely need to talk about what is stomach cancer first. The cancer is typically start in the stomach and in most cases it develop slowly through years. Pre-cancerous cells appear in the mucosa of the stomach. It is hard to detect and won’t show any symptoms whatsoever. Stomach cancer may start in different places of the stomach. The result is different outcomes and symptoms. 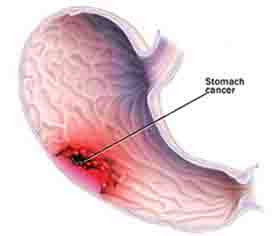 Due to its character and various types of stomach cancer, treatment options will vary depends on the cancer’s location. Awareness became the key, for the cancer can spread in different manners. Let us give you an illustration: the cancer can invade nearby parts and can grow through the stomach wall. What are Types of Stomach Cancer? This often referred to as NETs and can be non-cancerous or cancerous. The digestive system, particularly in hormone producing tissues, became favorite place for the tumor to grow. However, this type is rarely develop although carcinoid tumor became the most common type of it. Just like NETs, this can be non-cancerous (benign) or cancerous, and it is categorized as rarely developed. However, once developed, the tumor will grow in the cells of the connective tissue which support gastrointestinal tract. Most GIST have found in the stomach area. This is another type of stomach cancer and is very rarely occur. If someone has been diagnosed with this, it could be positively related to non-Hodgkin lymphoma, a type of cancer that begin to grow in lymphocytes, a part of the body’s immune system. This is the skin which similar to cells that developed between gland cells, which has a job: to make the stomach lining. When such cancer appear, a person with it will receive a treatment which exactly the same as adenocarcinomas. This one places ranked first, meaning it is the most common type that occurs in one who have diagnosed with stomach cancer. According to statistics, about 95 % of stomach cancer (precisely 95 out of 100 stomach cancers) is positively adenocarcinomas. This one has the same characteristic with that of squamos cell cancers. As you can see from above explanation, it is important for you to recognize which types of stomach cancer you have (if you have any) so that the doctor will suggest a treatment plan that suits your condition.